I think it's about time I get on this one. After all, I've been busy lately, finishing projects left, right, and center. And boy, does it feel good! I was having a bit of a slump for a while there. 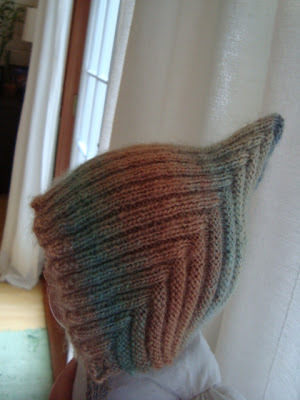 Not so inspired, neither the time nor the inclination, and the yarn budget was sort of, well, non-existent. But baby, I'm back. Here's a bit of what's been happening. My Shalom. Available for download Here, on Involving the Senses. My very first project for myself, and first almost sweater. (Read: No sleeves.) This was nice and easy, and fairly cute. After my initial pride and shock that I managed to knit it wore off, I'm slightly disappointed by the fit, I hate to say. It does fit pretty much how it's meant to, I guess, but I don't think it's necessarily the right fit for me. And being new to the whole figuring-out-a-size gig may have attributed to the fit problem. Oh well, not terrible for a first go. 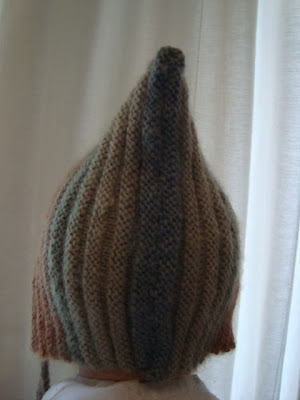 The cutest ever Pixie Hat, the free pattern available Here on Ravelry. I had been very keen on making this for quite some time. The pattern is quite simple, and easy to follow, even though I had no idea how it was meant to work itself into a hat for a while there. And then, genius, it just did! I love that. 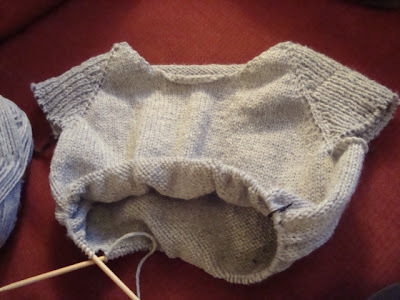 The yarn however, was tricky for me, in all my beginning knitter-liness. I had stashed some Mini Mochi, in the Beach Scene colorway, with no idea what it was going to turn into. And then, hello, a pregnant friend, and baby's dad's a surfer? Why, of course! Never mind that I wanted to pull my hair out, working with that fine a yarn. It did turn out so cute, and so soft, for a newborn bub. Okay, the hat is on Devin's doll, which is a little creepy, I know, but what can you do? That baby was just not available for photos then. 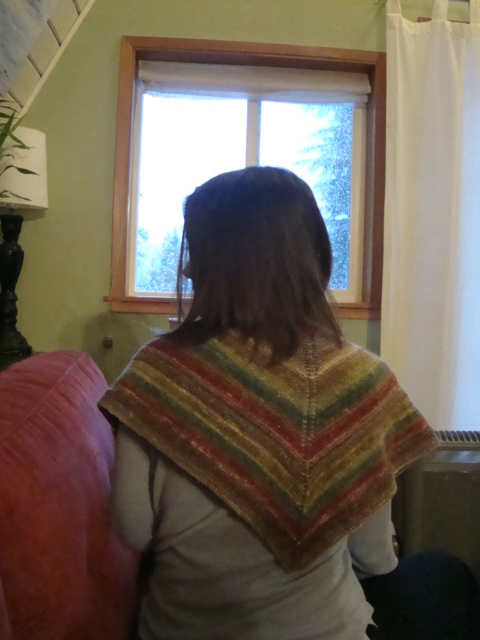 My completed Simple Yet Effective Shawl, pattern available for purchase here, again on Ravelry. I used one skein of Noro Silk Garden Sock yarn, which was absolutely lovely to work with, and softens up nicely after a little handwashing and blocking. I can't say that I've owned a shawl before (is this grandmotherly? nerdy? nah! ), but I think I kind of dig it. The only thing is it's a rather small shawl, more an accessory, than a cozy-up-for-winter thing. But, well, I am a girl after all, so I suppose an accessory or two should be embraced. Okay, this? This I am super excited about. 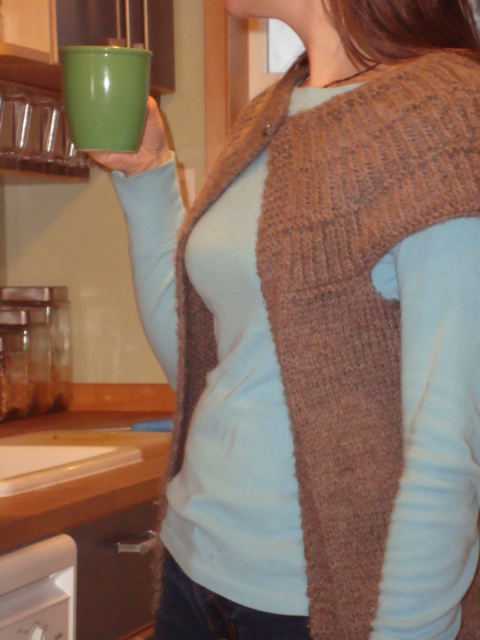 Because, well, it just so happens to be my first real and actual sweater. Kind of a milestone in knitting land. 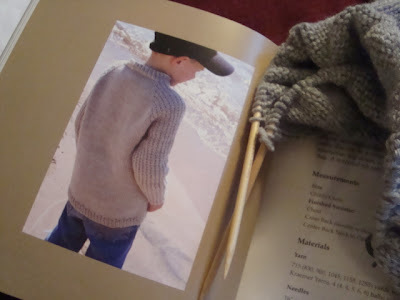 It's called Beachcomber, from Chris de Longpré's Timeless Knits for Kids, and it's for my wee boy. Who's actually not so wee these days, but you know. I fell in love with the photo, and well, Beachcomber? What's not to love? After ripping out, at the beginning, three, yup, count 'em, three freaking times, and figuring out a couple of stitches that I hadn't yet learned, the fourth try is going great. Pretty darn easy actually. I just may pull this thing off. Stay tuned. Oh, and wish me luck. So, we're accomplishing some stuff in my world, and it feels pretty, well, accomplished. I have a list approximately 3 miles long, of projects that I'd like to get around to, knitting and sewing, cooking and baking. We'll see what we get up to. Half the fun is in the planning and daydreaming anyway, isn't it?